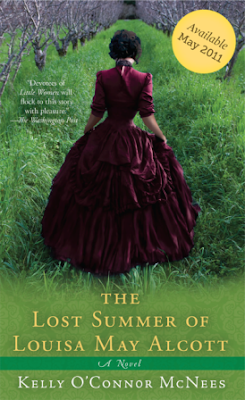 In honor of the paperback release of The Lost Summer of Louisa May Alcott I am pleased to bring you a guest post by author Kelly O'Connor McNees, as well as a 2 copy giveaway of her fabulous novel (to enter please scroll to the bottom of this post)! To all those boring, droning history teachers out there, ruining this fascinating subject for thousands of students, listen up! History is about stories. That means it has drama and suspense and comedy and tragedy and plenty of the unexpected. There are blood and guts, love and betrayal--and lots of great clothes. A couple years ago I started reading biographies of Louisa May Alcott with an eye toward writing a novel about her. I had always loved Little Women, and I knew Louisa also had a life as a suffragette and abolitionist, alongside her philosopher father Bronson Alcott. The more I read about Louisa--what she dreamed of and how those dreams were complicated and thwarted and sometimes fulfilled by circumstance and choice--the more I wanted to build a story around her life. I kept reading, but I felt my imagination stalling out. I couldn’t find an entry point into the story. It was kind of like being back in one of those boring history classes, copying down the dates. I was reading about her, but I wasn’t getting to the heart of who she was. I had lots of information, but I didn’t have a story. 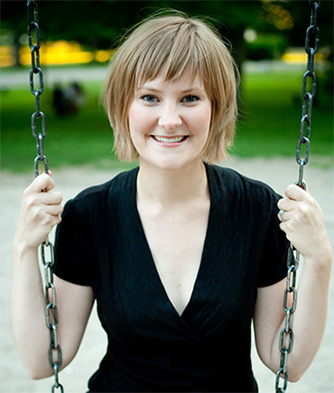 Kelly O’Connor McNees is the author of The Lost Summer of Louisa May Alcott , on sale in paperback May 3. She lives in Chicago and blogs at http://kellyoconnormcnees.com. Deftly mixing fact and fiction, Kelly O'Connor McNees imagines a love affair that would threaten Louisa's writing career-and inspire the story of Jo and Laurie in Little Women. Stuck in small-town New Hampshire in 1855, Louisa finds herself torn between a love that takes her by surprise and her dream of independence as a writer in Boston. The choice she must make comes with a steep price that she will pay for the rest of her life. - Giveaway ends on May 13th. This sounds like a great story!!! Sharing it on Facebook too! Very interesting - I'm intrigued. Thank you! This sounds like an amazing story. I can't wait to get to know Louisa. Having read Little Women several times, and being a big fan of Louisa May Alcott, I'm anxious to read this novel. Thanks for the giveaway. The book sounds very interesting, though it would be somewhat painful for me to read because “the choice she must make comes with a steep price that she will pay for the rest of her life”. What a terrific review! I loved "Little Women" and read it many times in my youth. A novel about Ms. Alcott herself would be an awesome read! I just ADORE that cover! It sounds like the author really worked to make this book come alive. I loved the Little Women books when I was a child. Little Women is my all time favorite story and I have read it again and again. I have also watched all the movies and tried to get my hands on as many other books by or about the author as I can find. This one has been at the top of my list and I cannot wait to read it...I love the idea of hearing Ms. Alcott's "real" voice and getting into her psyche...if even for a short time. I really like that you got fed up with the dry history stuff and went out to seek the real Louisa May Alcott. What better place that her own words in her le88tters? I have always loved her writings and this would be a treat to read. Please enter me in this contest. I have heard so many wonderful things about this book. Would love to own it! I really enjoyed this interview! Thanks for sharing. :) Excited to read the book. Enjoyed interview. Looks like fun book. Please count me in. Thanks for the interview and giveaway! It looks like an interesting book, and I'm glad that the author seems to have done her research on Alcott before she wrote it. My name, Amy (btw, Amy, you have a great name), was inspired by my mom's love of LITTLE WOMEN. I would love to read this book. I wish you had taught my history courses! It wasn't until I was an adult as well that I developed my interest in history and only because of amazing historical fiction novelists. I would enjoy reading this book. Thanks! I have been interested in this book - I have never read Little Women but it is something I have been hoping to read someday. Have added this giveaway on my sidebar. The more I hear about this book, the more intrigued by it. I agree whole heartedly with the statement about history being about stories. If it were taught that way, more people would enjoy it and learn it. I shared this on Facebook as Patricia Barraclough. I shared this on Twitter as pbbearclaw. I loved Little Women as a girl. 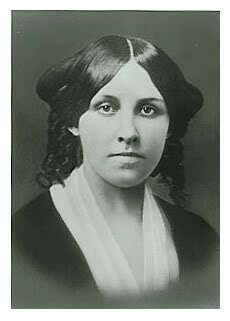 I can't wait to read a book with Louisa May Alcott as main character! I am passionate about LM Alcott and I just love McNees attitude about Louisa's voice -- so looking forward to this book. thank you for the giveaway! You always find the best books to giveaway! i want to read this!! the cover looks amazing and it sounds like it's a great read!! I love Louisa May Alcott and Little Women so much. This sounds like an incredible idea for a novel. Thanks for the opportunity to win this book!!!!!!!!! Wow what an interesting story idea. i'd love to read this! thanks! I'm intrigued by this book and would love to read it. Thanks for the chnace to win! I also posted it to my facebook! I love the Little Women story & this book sounds like a perfect mesh - also perfect summer reading! Think I may have got in by the skin of my teeth on this one! As Little Women is one of my favorite books, I really must have this one. thanks for the chance! I'm probably too late but I love this book! I want to own it!